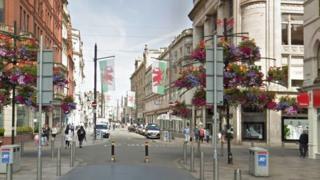 A man has been charged with carrying a knife following an incident in Cardiff city centre. Armed police were deployed to St Mary Street at 17:20 GMT on Friday after reports of someone being in possession of a weapon. The 23-year-old was arrested at the scene and has been charged with being in possession of a knife blade or sharp pointed article in a public place. He was released on bail and will appear before magistrates next month.